Who would know from looking at a cheap can of tuna that it was made from one of the most remarkable fish on earth? Tunas are large predators of the open ocean, reaching up to 1,500 pounds and swimming at speeds up to 70 km/hour. Because of this non-stop cruising, the tuna’s muscle fibers have a high capacity for using oxygen – which gives the fish its distinctive dark red color. Bluefin tuna is one of the most sought after delicacies in the world, with a record specimen selling for over $1.7 million in Japan in 2013! Prior to the 1960s most tuna sold in North America was used for scraps and usually ground up into cat food. It wasn’t until the emergence of sushi bars in the West that Americans and Canadians alike developed a taste for toro, the prime meat of tuna belly. This sudden demand for toro led to a mad scramble for tuna fishing— the price of tuna skyrocketed by more than 100 fold! 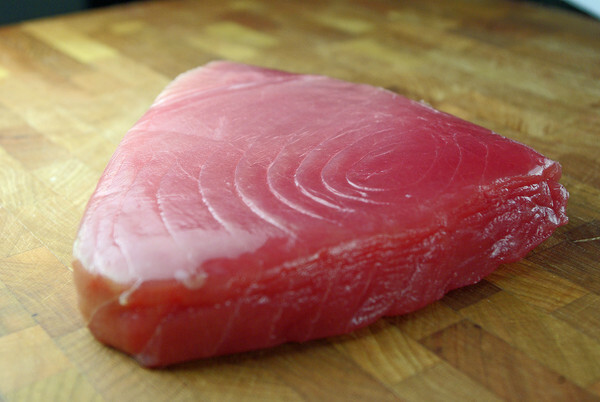 When buying tuna, we reject any steaks and fillets that don’t have a full, glossy appearance. Their odor should resemble fresh sea air and be only the slightest bit fishy. Although it’s a bit more expensive, we choose to purchase wild caught tuna sourced exclusively from sustainable fishery practices. Albacore tuna gives a great bang for your buck with its medium flavor profile, firm flesh and large flakes. Its steak-like texture lends itself perfectly to grilling and searing.